EPA approved, safe for homes with pets once it dries, and lasts up to 12 months. Sizeable one-gallon size will cover a lot of ground both inside and around the foundation of your home. A fantastic option for those worried about harsh chemicals or as a supplemental product to other roach killer products. Ideal for the hardest to reach areas that might have larger roach hiding spots. Expanding foam can treat open areas that are blocked off with only thin opening. Roaches are among the most adaptable creatures on the planet. Additionally, these critters are linked with several diseases and the rapid spread of germs. Dealing with a roach infestation can not only cause you to cringe but can also frustrating and difficult to deal with as roaches are excellent at hiding. Cockroaches usually hide during the day in cracks and crevices in walls, along with door frames, and in secure places such as cupboards linings, basements, electrical devices, and breaks in building foundations. This tendency to hide in small areas is part of what makes roach killer sprays such a useful product. When bait stations, gels, or powders alone are not working, using a roach spray can help rid you of your pest problem. With all of the products below, we recommend using gloves to protect your hands when you apply them and take precautions to avoid inhaling any sprays. 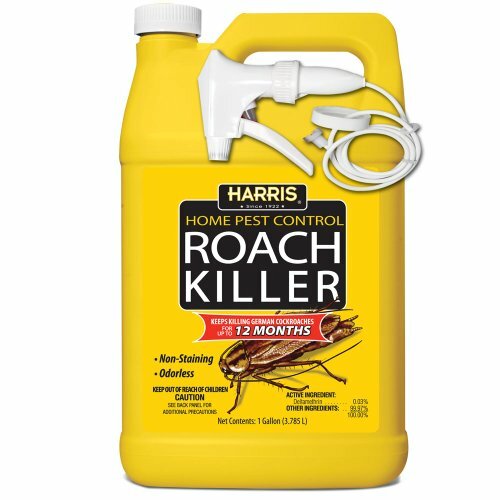 The Harris Roach Killer, Liquid Spray with Odorless and Non-Staining 12-Month Extended Residual Kill Formula is a fantastic value at just over $20 for a full gallon. This spray kills roaches after the spray dries. The Harris company states that this formula will continue to kill cockroaches for weeks after application as long as it remains dry. Reviews are mixed, but if sprayed heavily enough in areas cockroaches are most prone to be, this product still seems to be successful for the majority of customers. It is recommended you do not go too lightly with the spray if you want it to work well. Cover roach-prone areas thoroughly and allow to dry. 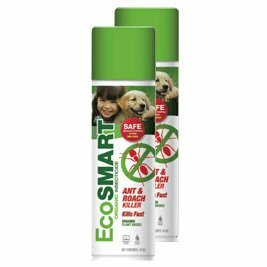 EcoSMART’s Ant and Roach Killer Spray eliminates pests quickly and efficiently. The spray is made from organic insecticide using a powerful plant-based formula to get rid of cockroaches. Because of its composition it is non-toxic making it safe to use around humans and pets when used as directed. Instead of the normal toxic fumes that usually come with spraying insecticide to kill pests, this one have a very powerful mint smell as it has wintergreen and peppermint oil as active ingredients. The fragrance doesn’t last a long time and is typically gone within a day or two, but the pests will not return. 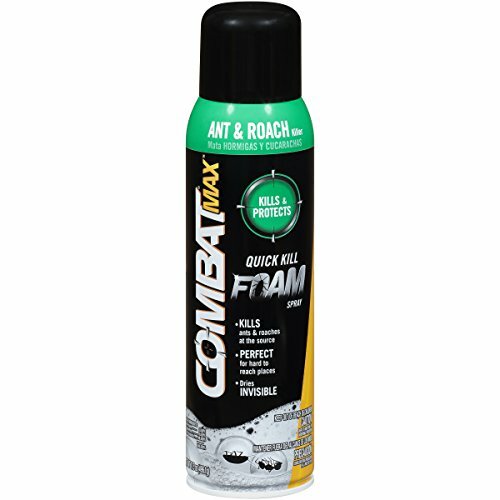 Combat Max Ant and Roach Killer Quick Kill Foam Spray is meant to eradicate roaches on contact. The benefit of the foam version of a roach spray is that you can see more clearly where the product goes down to detect which areas you have treated. This product dries invisible and continues to kill roaches for up to 10 months. This foam expands, which is great for hard-to-reach places such as deeper crevices or cracks near the foundation around buildings. Some Consumers stated it ate the varnish off of wood tables, and do not recommend spraying it directly onto cloth. It is also indicated as having a forceful spray, so use caution to avoid blow-back into your eyes. Raid Max Ant & Roach Spray is part of their three-point defense system. With products meant to prevent and control bugs, the spray is designed to attack insects specifically. The “two-way” spray feature of this bottle offers a wand that can snap up or be put down for two spraying options. Snap the rod up for a more laser-like spray meant for tight areas such as cracks and crevices. With the nozzle wand down, you can get a broader spray to cover larger areas. This pinpoint spray option with the wand nozzle is ideal for thin cracks in the backs of cupboards, around baseboards, along window edges, and along building foundations. Regardless of the product you use, if you are trying to remove cockroach infestation, you need to clean up any beverage spills and food crumbs right away so that sustenance is not readily available for the roaches. Always read directions and warnings on labels before use. You may need to try more than one method if you have a severe infestation or have never dealt with cockroaches before. Do not let children or pets near any spray until it is thoroughly dried. We recommend using gloves and even dust and fume filter masks and safety goggles while using sprays. Do not mix chemicals, as many can cause fumes that are toxic to humans. Allow any spray you use to dry completely before applying another type of roach repellant in your house. Do not apply poisons in vents where the chemicals can be blown through the air in your house or apartment and cause respiratory distress. Roaches are attracted to food and water sources in homes, and warmth in more temperate climates. Keeping your house as clean, sanitized, and moisture-free as possible is essential to avoid attracting roaches. Remember, cockroaches are small, even if they seem large at two inches. So, it only takes a little bit of food or moisture for them to find enough water to survive. Remember fruit trees if you have any right next to your house, too. Fallen fruit on the ground should be cleaned up as much as possible. It might seem extreme, but the more you can limit supplying roaches with nourishment, the less reason they will have to move in. With any product you select, if you are trying to remove cockroach infestation, you need to clean up right away so that food is not readily available for the roaches. Roaches are also attracted to moisture in houses and apartments. If you live in a humid setting, invest in a dehumidifier and dump the bucket often. Using a dehumidifier in your basement, or even in the central part of your house or apartment is a good idea especially if you live in a high-humidity area. Think about all areas of water sources cockroaches could get to such as pet water dishes, condensation on toilets, dripping faucets, and water left on the floor after exiting a shower could all attract roaches. Wiping away water anywhere you find it and making dishes harder for cockroaches to reach can help. While you never want to mix two types of poisons together, you can consider two methods of pest control if you have an excessive number of roaches. Some people have a professional come in and bug-bomb their home, then follow up with their own bait to prevent cockroaches from returning. However, relying on one product might not work well if you have a heavy infestation. Make sure areas are well-ventilated when using sprays. One option is to try a sprayer, allow it to dry thoroughly, and then also set up a few roach bait stations as an additional measure.